You'll be £12.99 closer to your next £10.00 credit when you purchase 1st Leibstandarte - Adolf Hitler SS Panzer Division. What's this? Possibly the most famous of Hitler's SS panzer divisions was the Leibstandarte; it bore his name and shared his fanaticism. The Leibstandarte had proved itself to be highly effective in battle and had fought in virtually all of Germany's campaigns since 1939, justifiably earning the label 'elite'. However, constantly called back to the front to stem the advance of the Red Army on the Eastern Front, the division was much reduced in power through loss of manpower and a paucity of equipment. In the spring of 1944 the Leibstandarte was again refitting in Belgium, a process that was still under way when the Allies stormed ashore in Normandy. The effectiveness of Allied deception measures, however, kept them fixed awaiting the landing of Patton's phantom army in the Pas de Calais area. Consequently it wasn't until the second half of June 44 that the Division began its nightmare march to Normandy, harried all the way by fighter bombers. Arriving at the front, elements of the division were thrown into the battle piecemeal to prop up the crumbling German Army, as Montgomery launched blow after blow on them. The Leibstandarte's first battle was to choke off Operation Epsom, fighting the Scots and the West Countrymen of the Wessex Division in the dense hedgerow country of the Odon Valley. But perhaps their greatest achievement was halting the Great British armoured advance, Operation Goodwood; a battle that has been characterised as 'The death ride of the British armoured divisions'. As the Allied breakout gained momentum on the US flank, Hitler ordered the Mortain Counter Attack, against the advice of his Generals, and the Leibstandarte marched west to cut the vulnerable American advance. Under cover of mist the battle started well for the Germans and desperate fighting with isolated GIs resulted but, as the weather cleared, the fighter bombers lashed the panzers who were forced back. The exhausted German Army fought its way back towards Falaise and seeming destruction by the encircling Allies. Forcing their way through the Corridor of Death a much higher proportion of the Leibstandarte escaped and the Division lived to fight another day. The elite Leibstandarte is the subject of considerable fascination and study. This film, written and presented by established historians and battlefield tour guides, will strip away layers of myth and take the viewers to the places where the SS fought the British, Americans and Canadians in one of the most costly battles of the Second World War. 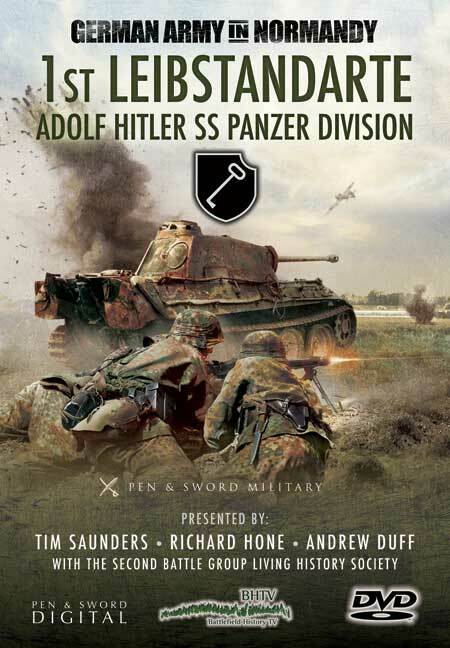 A superior documentary describing the actions of the 1st SS Panzer Division in Normandy. It begins by exploring the origins of the SS and follows the evolution of the Leibstandarte from a ceremonial bodyguard to an elite force which participated in numerous campaigns, including several spells on the Eastern Front. Stationed in the Pas-de-Calais and dogged by air attacks, it was not until the 24th June that the Division was able to enter the Normandy battle, being committed piecemeal against the British and Canadians around Caen. As with all Battlefield History TV documentaries, a number of superbly informed historians walk the ground and explain key moments in the brutal fighting, which initially took the form of German counter-attacks and then a series of grim defensive battles as they struggled to contain the Allies. 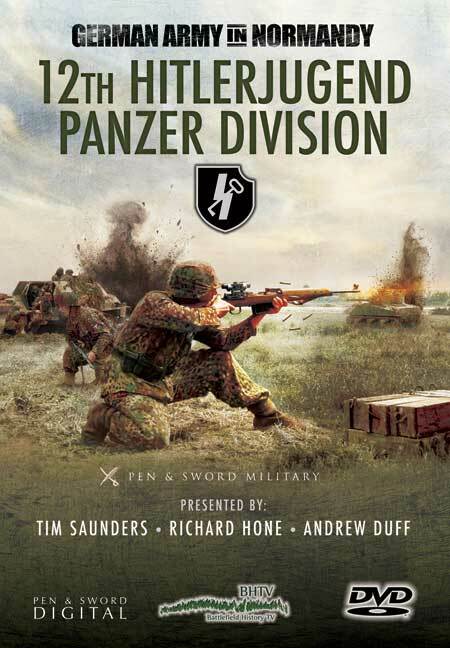 Included amongst these is a very detailed account of Operation Goodwood and the Division's role in halting the offensive of three British armoured divisions, and the Leibstandarte's ill-fated attempt to cut-off the American break-through in the West, culminating in the horrors of the Falaise Gap from which they narrowly escaped.